Telwyn muses on why he doesn't mind participating in the war of Republic vs. Empire while feeling somewhat annoyed with what's been happening in WoW's Battle of Azeroth lately. It also reminded me of a post that Tyler made on MMO Bro a few months ago, in which he declared that factions had outstayed their welcome. I'm pretty much of the opposite opinion as him in that I enjoy myself a good faction war in an MMO, and am really pleased that SWTOR is finally turning its focus back onto Republic vs. Empire. When done well, factions can help define your identity in a game and make you feel more attached to it. That's very much been the case for me in SWTOR, where I've been feeling a staunch affiliation with the Republic since day one. They are the classic good guys, and that's something I want my character to be too. I never felt nearly as much attachment to the Eternal Alliance, despite of it being led by my own character according to the story. It just seemed to lack definition beyond wanting to oppose Zakuul, and even that was something I never fully connected with, and more importantly, hadn't chosen for myself. I wrote about this a few months after Fallen Empire's launch, how my trooper being shoehorned into a narrative that kept her away from her old faction made her feel like she was losing her identity. 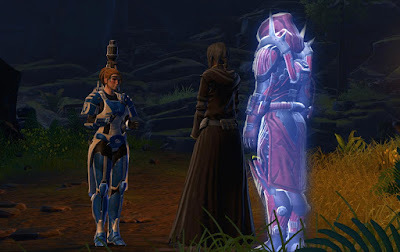 With how heavily SWTOR relies on having players emotionally invested in their characters, it was actually quite saddening, and I'm not surprised that the game lost many long-time players during that time. I suspect that this is also at least partially responsible for a lot of WoW players' current dissatisfaction with their game. They haven't been forcibly removed from their factions, but the Horde in particular has changed a lot ever since Thrall gave up the mantle of warchief. It's certainly a far cry from the slightly primitive and ugly band of misfits it started out as back in Vanilla. This isn't a problem with factions per se, but with the writers and devs not caring to portray them consistently and to keep them distinctive. It's not enough to paint one side red and one blue; you've got to give people reasons to want to choose one over the other. Humans are very tribal creatures, and we love to sort the world into us vs. them at every opportunity. In real life, this can take forms that are quite problematic, but in the context of a game I don't see a problem with it in principle. Having a faction conflict brewing in the background (or even in the foreground) of your MMO is a way of generating conflict and interesting plot points that are both easy to come up with and easy to understand even for the casual player. It means that you don't constantly have to come up with new threats to fight, but that there's a reliable staple that you can fall back on and use to fine-tune just how threatening you want a given situation to be, because it can provide story hooks on pretty much any part of the scale, from small, local and contained to something that's threatening millions, depending on how much you want the conflict to heat up. I sometimes hear the argument that faction war doesn't work as a narrative device in an MMO because neither side can win. That always strikes me as weird though because that is exactly what makes it entertaining. You don't want the NPCs to outright say it, but I think as players we probably know it deep inside, even if we're not consciously thinking it: The other faction may be our enemy, but we don't really want them to lose, not fully. You want to be able to celebrate victories against them, but you don't want them to go away entirely. After all, you fight them for the fun of it, not to actually eradicate the enemy, and who are you going to fight if the losers pack their bags and go home? So the goal of well-written faction conflict is to have the two (or more) sides always fighting about something or other, maybe allow a minor victory here and a loss there, but it shouldn't feel too serious. To me, the storyline on Ossus is a pretty good example of this. If you look at it from both sides, it's not entirely clear who came out the winner, but on either side people get to feel like they've achieved something for their faction and get to pat themselves on the back. Just as we like it! And again, at least looking at it from the outside, this seems to be another thing that WoW's Battle of Azeroth got wrong, by trying too hard to up the stakes and featuring things like the utter destruction of two capital cities. These things make for great PR pieces in a "look what we did, we're so daring" kind of way, but it's not really going to make players happy. 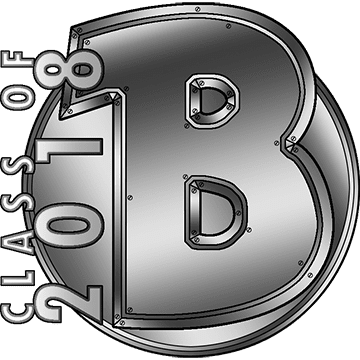 The "winners" don't exactly get a great sense of accomplishment from the writers having written a story about them burning down trees, or from seeing a cut scene of their leader taking over an enemy stronghold; and the losers just feel sad about losing one of their bases. It makes things more dark and serious for the benefit of no-one. We want to play at being at war; not be reminded of its worst aspects. Now, you could say: That's all well and good, but why do we have to pit players vs. players? Couldn't we just have all the players on one side and in a perpetual conflict with an NPC faction that's never fully defeated? And I guess the answer is that yes, we could, but I also think that wouldn't hold players' attentions nearly as well, because just like there's a big difference between PvE and PvP, I think it's much easier to get into that particular headspace of taking your enemy seriously but not wanting to see them crushed completely when you know that you're up against real people. NPCs that you can never really fully defeat just tend to come across as annoying more than anything. So I say: Bring on the Empire. Down with the Sith! But do let them get away at the end so they can live to be the (interesting and highly entertaining) baddies another day. I think both cases are correct, and that's due to the narrative. In SW, there's a clear line between order/empire. The gap is ever present, and the game clearly pushes the whole light/dark angle to choice. WoW...all the agents are external for the past 10+ years. There's no actual basis for factional conflict ('cept extremely poor writing), when the world is always 5 minutes from blowing up from some random invasion/old god/ultra demon, and both factions are doing the exact same thing, just wearing different colors. 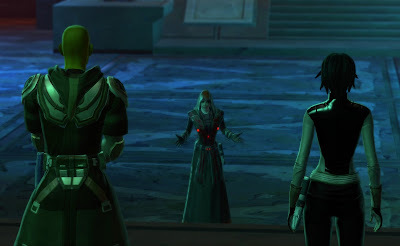 SWTOR's big bad guys always fit in the envelope of SW, they follow the same ethical rules. WoW hasn't done that in... well ever, now to think of it. I agree that WoW's factions have been a mess for a long time, but I still remember their state from Vanilla. The Horde in particular had a very different feel to it then. And yeah, there were big bads back in Vanilla too (C'Thun!) but they were only really seen by a tiny minority. For your average player getting ganked by the opposite faction in places like Ashenvale or Hillsbrad was a much bigger problem. I played on a PvE server and still remember hating how much of a punch those guards packed at the time, not to mention their insane aggro radius, lol. The Star Wars IP needs to be faction based because of the ideology established by the movies and books. I'm sold on the idea that Jedi and Sith can't coexist long term thanks to everything I've read and seen elsewhere. If you're making a game that's based on brand new IP though, factions would be tough to sell. There's one big downside to factions: You can only queue with your faction. So you're queue is cut in half or possibly even in thirds for something like Dark Age of Camelot. You're top level agents of an empire that is at war with another empire. PVE missions, flashpoints and operations have you queueing with everyone on the server to fight the good fight. PVP is a little more complicated. All is not well in your empire. There's a controversial but popular NPC working against the existing emperor. As a top level agent, you could find yourself working for or against the emperor each time you queue. For RP'ers I'd provide a switch allowing you to declare if you're a loyalist, who always works for the emperor, or a rebel who always works against the emperor. This setup provides plenty of room for deep story lines, while allowing you to group with ALL your friends. I'd also lose permanent servers, but that's another post! Sorry for the bad formatting, I tried pasting it in from a different source this time!